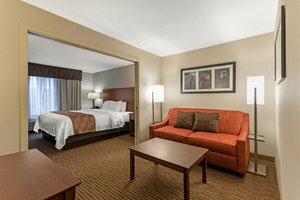 Welcome to Quality Inn & Suites University Fort Collins, your home away from home. 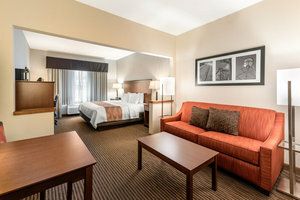 A stay in our hotel rooms in Fort Collins promises reasonably priced accommodations and exceptionally friendly staff dedicated to providing you with the best possible service. 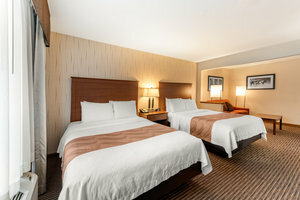 All of our rooms have been recently renovated with upgrades like freshly tiled, modern floors. Wake up to a complimentary hot breakfast every day with fluffy eggs, breakfast meats, and more! Peruse a daily free newspaper as you dine or use our high-speed Wi-Fi to stay connected with home or the office. From in-suite refrigerators and microwaves to coffee machines that are well-stocked with coffee and tea, our suites in Fort Collins, CO promise all of the comforts of home. 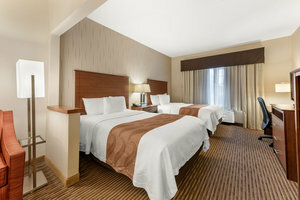 After a long day of sightseeing in and around the area, return to your fully-equipped room, stretch out in front of the TV, heat up your leftovers, and unwind with a cup of tea. Alternatively, soak in our on-site Jacuzzi or wash off the stress of the day with a dip in our large indoor pool. At our Colorado Quality Inn & Suites, we understand the importance of balancing work and play. As a result, we have designed all of our rooms to provide you with a precise combination of relaxation space and workspace, with degrees of separation between the two. Each guest room is divided into two parts, one featuring a spacious living area and the other, a separated bedroom. 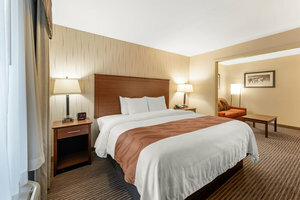 Our corporate guests enjoy that our hotel rooms in Fort Collins also come equipped with an iron, ironing board, and a work desk to ensure that you have everything you require to conquer the day ahead. Book your stay today with Quality Inn & Suites University Fort Collins and experience superior comfort and convenience at an affordable rate!